You may wish to download just one cash receipt template or all of the templates offered for different reasons. If you only need a single receipt and do not foresee needing more in the future, you may wish to opt for the Word template that prints just one receipt to a page. 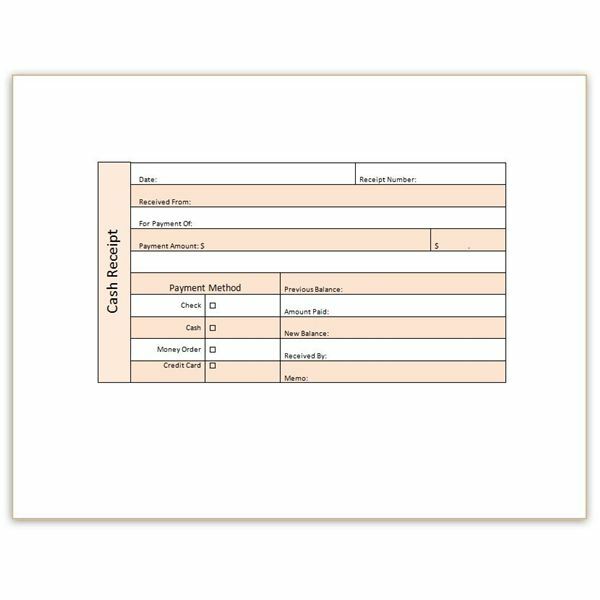 If you want to keep several receipts with you so that you can fill them out by hand and provide them to renters, customers or clients, you will probably want to download the Word template that prints three cash receipts per page. This allows you to print several pages of blank templates that you can cut apart and store. Finally, if you like the functionality of Excel, you can download the Excel receipt template that offers some built-in functions and features to save you time. 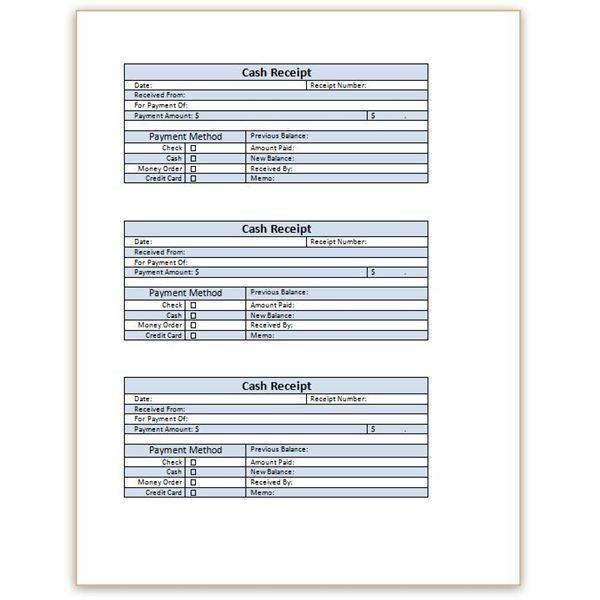 This template allows you to create and print two separate cash receipts using Microsoft Excel. Each template has a date line that updates automatically to the current date, although you can change it to any date you wish to enter. The receipts have spaces for receipt numbers, the name of the payer and the reason for the payment. There are two sections for the payment amount, including a text line and a numerical space. At the bottom of each template is a section for the amount due and amount paid. When these amounts are entered, Excel calculates the new balance automatically. The Payment Method section has interactive check boxes beside each payment method, such a cash or money order, so you can simply click on the one you choose. There is even a dotted line between the two receipts so that you can cut them apart more easily. 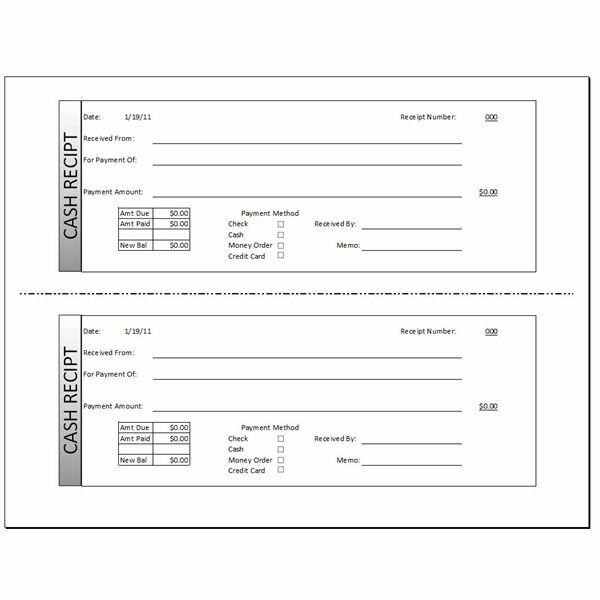 If you only need one cash receipt, download and print this template using Microsoft Word. You can print it as is and fill in the information with a pen or you can complete it in Word and then print it when you are done. The template was made using a Word table, so you can easily change the colors or other formatting if you desire. The final option in this collection is ideal for those requiring several cash receipts, as this Microsoft Word template produces three of the same receipts per printed page. Each receipt has a place for the date and receipt number, payment amount and payee's name, payment method and other important details. You can change the blue and white table colors by going to Word's Table Design tab or menu.